With all the possibilities of die cutting these days we can die cut pretty much any shape out. In fact, I have no clue how companies keep coming out with new and new dies we all just have to have. Back in the days when I got my first die cutting machine and a few of my first dies I would always cut the shapes out of white paper or cardstock. Through the years I noticed I almost always started with white and pretty much always kept my die cuts that way (until I discovered gold mirror cardstock). 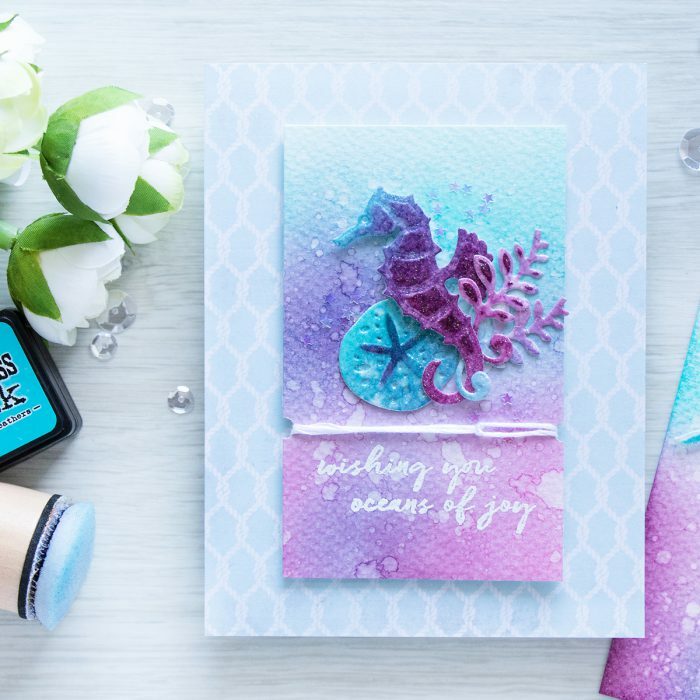 Creating a white die cut doesn’t mean it can’t be changed or altered along the way and I’ll show you one of the ways to step up your die cuts and turn them into something completely different and unique in this blog post and video. 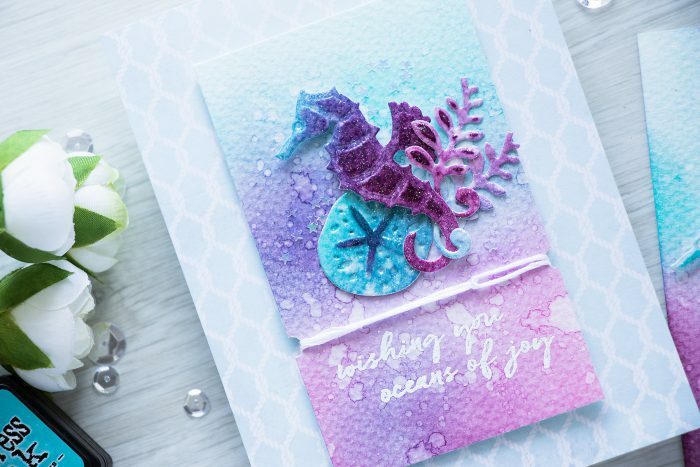 I used watercolor paper as well as several colors of Distress inks (I went with Peacock Feathers, Seedless Preserves and Picked Raspberry) to create an ink blended background which I later die cut with the help of dies from the Seahorse and Sand Dollar set. Alternatively, you can first die cut the shapes out and than do the ink blending, however I prefer to do this the other way around. I also stenciled additional ink through the die to add more detail. 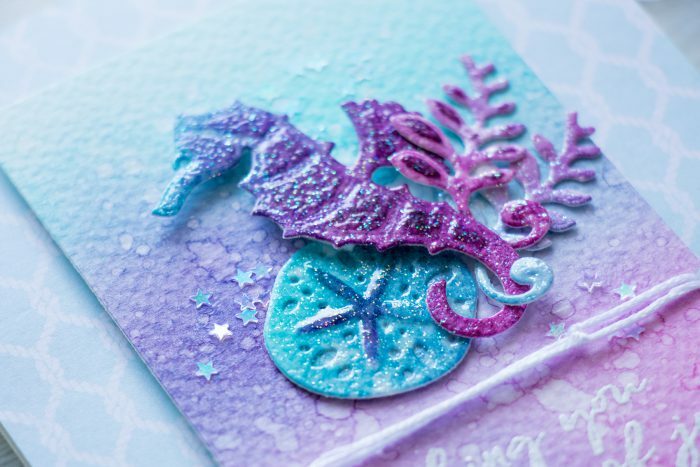 The top shimmery layer was added with the help of Sparkle embossing powder – I used embossing ink in a bottle (this is an easier and faster way to add embossing ink to a large die cut) instead of embossing ink pad to quickly cover my die cuts with embossing ink. 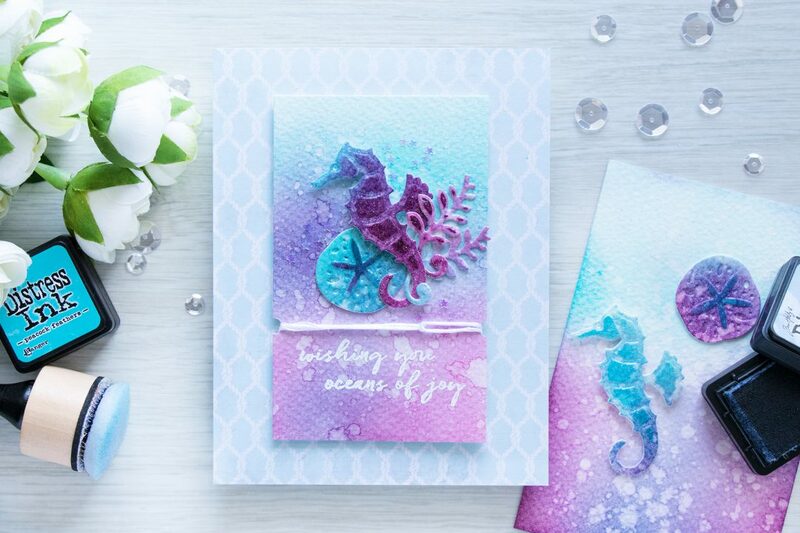 The “Wishing You Oceans of Joy” sentiment from the Seahorse stamp set from Hero Arts worked perfectly for this project and was heat embossed in white directly onto the ink blended background. What a beautiful card, I just love the colours you have used. This is soooo cool! In love with color and dimension!